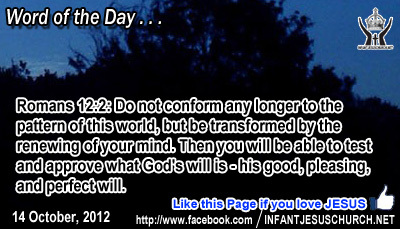 Romans 12:2: Do not conform any longer to the pattern of this world, but be transformed by the renewing of your mind. Then you will be able to test and approve what God's will is - his good, pleasing, and perfect will. Heavenly Father, please guard our soul from pride, our heart from heartlessness, and our mind from too much focal point on unimportant things and not enough on your things. Teach us, our heart what it means to be about our Father's business, especially in the world of our thoughts! In the name of Infant Jesus, we pray. Amen. Those who are kind towards God and towards their neighbor find that they cannot out give God in his kindness towards us. God blesses each one of us with the priceless wealth of his kingdom freedom from fear and the gripe power of sin, egocentricity and pride which block his love and grace in our lives; freedom from being alone, separation and rejection which keep his children from living together in love, peace, and unity; and freedom from despair, anguish, and disillusionment which blind our visualization of God's power to heal every hurt, bind every wound, and remove every mark which mar the image of God within us. God offers us treasure which money cannot buy. He alone can truly make happy the deepest desire and desires of our heart. Are we willing to part with anything that might keep us from looking for true joy with Jesus? Infant Jesus, you have captured our hearts and unlocked us to the treasures of heaven. May you always be our treasure and delight and may not anything else keep us from giving you what we have.